BAYANTSOGT, MONGOLIA-MARCH 14 : Frozen animal remains along the Mongolian landscape March 14, 2010 in Bayantsogt, in Tuv province in Mongolia. Mongolia is still experiencing one of the worst Winters in 30 years with 68 % of the provinces effected. Presently the government has declared an emergency requiring foreign aid to alleviate the impact of the " Zud" ( Mongolian term for a multiple natural disaster) caused by bitter cold and thick snow. Recently, the UN allocated $3.7 million for humanitarian assistance to Mongolia from its Central Emergency Response Fund (CERF). 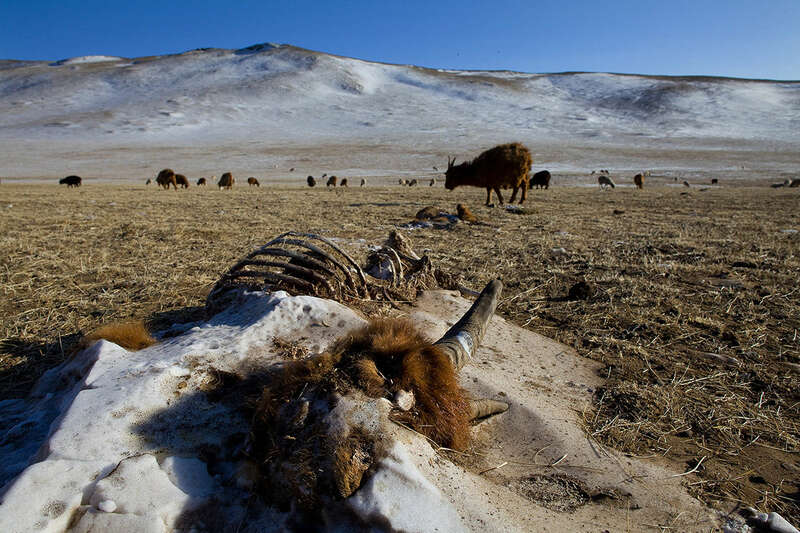 The United Nations Development Program (UNDP) is developing a cash-for-work program in Mongolia under which herders will earn income to clear and bury the carcasses of the over 2 million livestock that have perished nationwide. Currently 1.5 m goats, 921,000 sheep, 169,000 cows and yaks, 89,000 horses and 1,500 camels had died according to the various UN agency reports.